From Styrofoam cups to artificial organs, plastics are perhaps the most ubiquitous and versatile material ever invented. No invention in the past 100 years has had more influence and presence than synthetics. But such progress has had a cost. No ecosystem or segment of human activity has escaped the shrink-wrapped grasp of plastic. 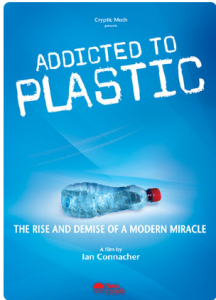 On your campus, Ian will begin the program with an introduction, screen the award-winning film ADDICTED TO PLASTIC and then host a lively discussion, and Q & A.
ADDICTED TO PLASTIC is a program about solutions to plastic pollution. The point-of-view style documentary encompasses three years of filming in 12 countries on 5 continents, including two trips to the middle of the Pacific Ocean where plastic debris accumulates. The film details plastic’s path over the last 100 years and provides a wealth of expert interviews on practical and cutting edge solutions to recycling, toxicity and biodegradability. These solutions – which include plastic made from plants – will provide viewers with a hopeful perspective about our future with plastic. Connacher has been a freelance journalist, associate producer for CBC Television in Canada, a segment producer for Discovery Channel, as well as an award-winning filmmaker. He has been covering environmental issues for more than 10 years. The show was great! We had good attendance for a Friday night on a college campus. The students loved it, and we will actually be meeting to reflect on the documentary and discuss what we can do on our campus to combat the widespread use of plastics in all of our products. Thank you very much for helping bring Ian in to screen his documentary. It was very interesting and informative. And the Q&A afterwards was excellent, people had thoughtful questions and Ian did a wonderful job answering them and engaging with us! He was also very funny and personable.